I started writing for the blog a little before I got married. Around the time of my anniversary each year, I’ve written a post about my married experience. For my first anniversary I shared “4 Things I Didn’t Expect” (about marriage) and last year I gave you “4 Reasons Why Marriage is Worth the Risk (Even in the Age of Ashley Madison)“. This year I was thinking about what sort of married life wisdom I could share with you, and the only thing that came to mind was advice that older and wiser people had told me. So, as my third wedding anniversary approaches (next month) I’ve decided to share the three best pieces of advice I’ve received during my marriage. I’ve always been a fighter when it comes to my relationships. I think that discussing an issue can allow you to unearth the deeper problem and talking things out can keep you from feeling resentment. By the time I got married I had also heard and/or read one piece of marriage advice over and over again: don’t go to bed angry. I’m glad someone told me to cast that advice aside. Instead, they suggested that sometimes we really should go to bed angry. Because sometimes, even the best of us want to strangle our partner for a reason that will seem pretty silly the next day. Often, by postponing that impulse to vent your irritation, you can avoid making an argument out of something that doesn’t really matter. Last week saw an announcement from fast food chain Wendy’s that they’d be rolling out some 6,000 “self-service kiosks” in their restaurants. This follows rulings in California and New York that would gradually raise the minimum wage from $7.25 to $15.00 an hour, and as you might imagine the connection has not been lost on people. Of course, when I say “people”, I mean the ranks of bougie suburbanites who have been gleefully cackling over Wendy’s decision. It is these folks who I’d like to address directly today. Seriously, what kind of demented, spiteful people are you? After decades of stagnant wages and crippling poverty. After years of broken promises and betrayals by their supposed liberal representatives. After months and months of fighting and campaigning finally the poor have a victory. Did I say **** you yet? You guys sound like mustache-twirling caricatures from some turn-of-the-century political cartoon. What are they going to ask for next? An eight-hour work day? Paid lunches and sick leave? No one wants to be “on the wrong side of history”. No one wants to be wrong, period, and even those of us who raise their hackles at being described as “progressive” fear that those words, when leveled against them, might come true. To hear that phrase is to be threatened, told that you’re a dinosaur; except without any of the perks like monstrous size and claws and teeth, more the being pushed out by newer lifeforms and soon to be extinct. The message is, essentially, to keep up or be left behind. To be asked whether you want to be “on the wrong side of history” is only hypothetical as far as what your choice will be. That the world will actually be changing is not the question; it’s being stated as a direct fact. “But I think we are finally becoming more of one world, and you’re going to see more and more diversity in the selection of characters. [. . .] It’s all going to change. I think sometimes we consciously look at it. We would love to have a superhero, we would love Marvel to create a superhero — We can create villains, but we’d love to have a Chinese superhero with something that is really interesting and how they got here, and what is their issue, and so on. But it’s coming. And it’s inevitable. It’s really inevitable. But it didn’t come naturally to comics in the days that no one was aware that there were actually other countries and other people. I don’t work in prisons. I mean, I might have to in the near future, but as of yet, I haven’t. Today I’m going to be making some pretty bold statements, and I want to be up front about my reasons for doing so. 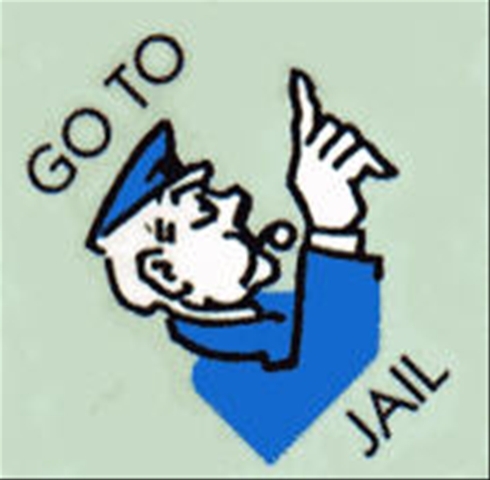 While I don’t work in the big house (I have had to deal with min-sec “transitional housing”- if that counts for anything), I do work exclusively with an ex-felon population. As with a bad car wreck, you don’t have to be an expert to a look at the current situation and work backwards to figure out just where things started going wrong. Now I’m not saying that prisons help cause crime, just that as they stand today, they aren’t doing a whole lot of helping. 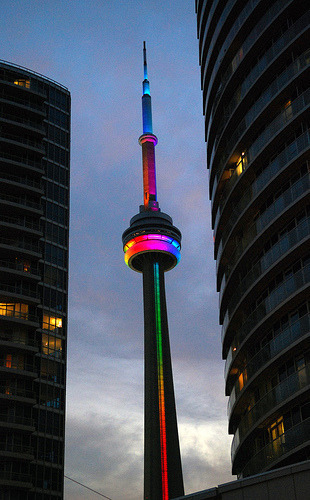 The CN Tower, putting on a special light show for Pride Week. Imagine my surprise when I realized that this upcoming weekend is a long one due to Canada Day [July 1]. Imagine my continued surprise when I found out that not only is this weekend Pride Weekend, but that it actually coincides with the national holiday more often than not.